Our blog is again helping you in various difficulties. Microsoft says 700 million people uses windows 10 but 15th percent of its users didn’t know how to use this window in easy way. 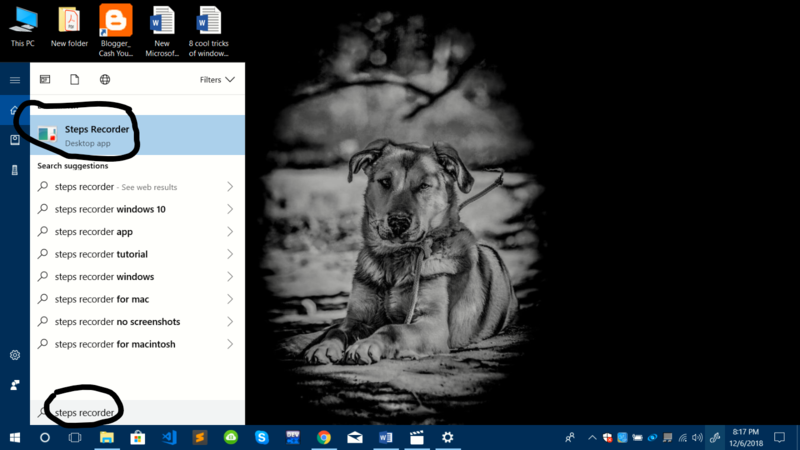 In this blog I’m going to tell you about the most useful tricks which you must use in windows 10. Which might help you to make your work easy and help your laptop or computer to be healthy. You know Windows 10 is the update version and the most advance version of Microsoft. It is used in all over the world. It helps the people all over the world in many fields in the form of updates, efficiency in works which is somehow difficult in previous versions of Microsoft. Now I will tell you about the hidden features about windows 10 that are much hidden to its users. When you get up from your office desk’s or let your PC roughly in home which contains some data which is not virtuous to your children’s or your family members. In these types of situations you should use “dynamic lock”. It is the best update of Microsoft windows 10. 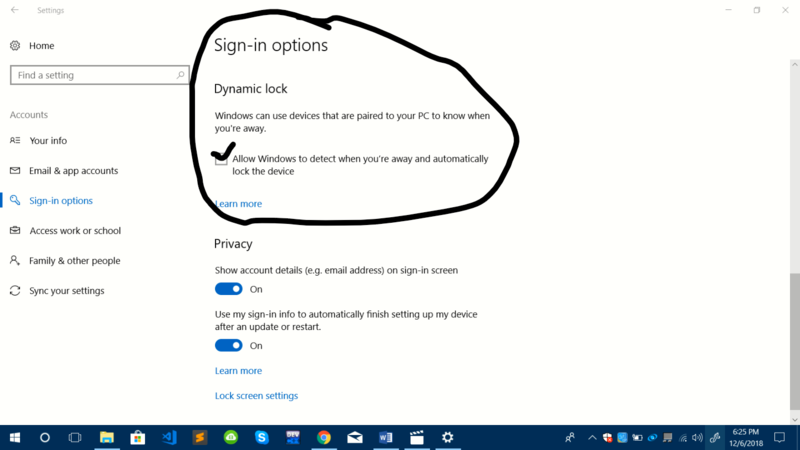 For allowing dynamic lock in your PC you should connect your smart phone Bluetooth to your laptop or computer whenever you are using your personal computer and switch on dynamic lock in setting. 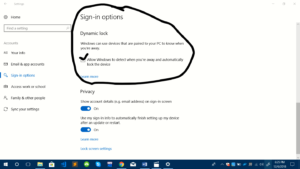 Dynamic setting are found in sign-in options in setting menu. This feature will help data safety. your data will be protected. no one can check or theft your data. When you connect to your PC with your smart phones Bluetooth this would work but when you left workplace with your mobile phone your system will automatically lock when it is going out of range to your Bluetooth connected smart phone. You are also facing this type of problem which is disturbing you to store your necessary documents or files in your PC. 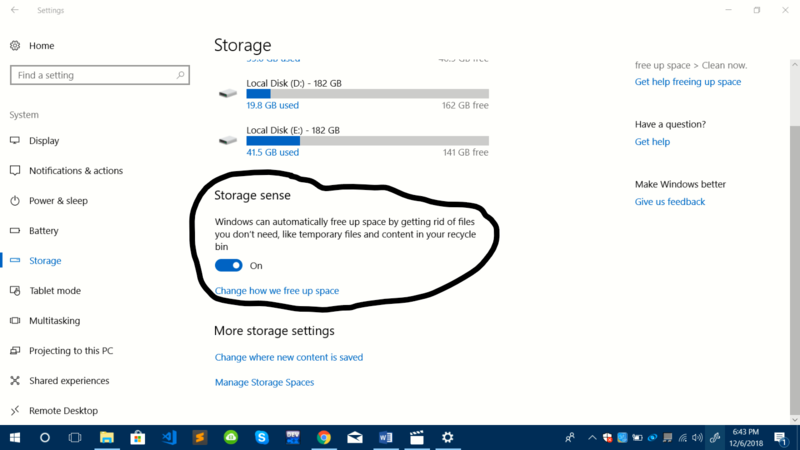 In this situation you should use the “Free up storage via storage sense”. This would help you in escaping from storage issues on you PC. 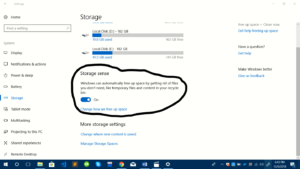 To enable the storage sense on your laptop or computer you should go to devices button in setting menu and click on storage button there you will find button to activating storage sense. Then you have to click on each drives and delete unnecessary files in “Temporary Files ”. This image guides you to the accurate path to enable the storage sense. This is the best way to save our space in our laptop or computer. This update also saves us from wasting of our drive space without storing a useful document. When you use your laptop for long time or long working hours you can feel discomfort while using your laptop, this is because of blue light in display. 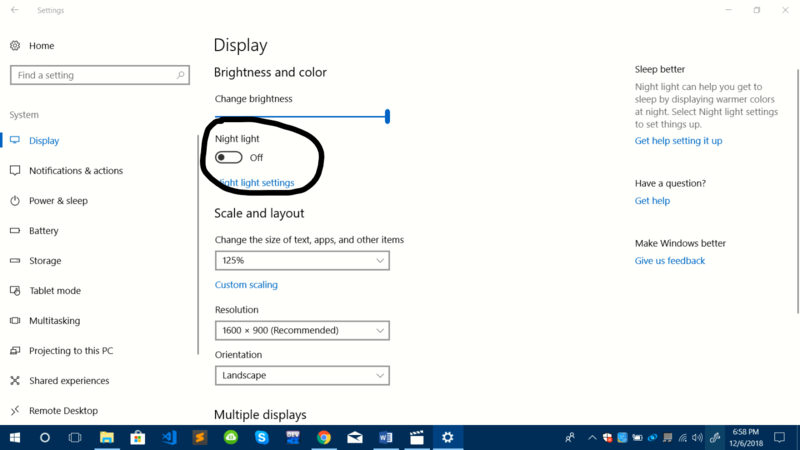 For this Windows 10 use flux that filters out the blue light in your laptop. 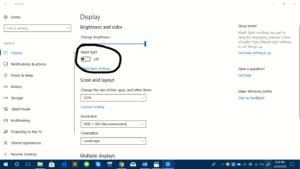 Windows 10 now offers a “Night light”. You should see this option inside system button in setting menu. When you switches on this feature you see the screen temperature is changed. And you feel more comfortable while using this feature. You can also schedule the time for opening of this features instead of switch on for everyday and also set the screen temperature according to your relaxation, See the below picture and use this feature. This picture will help you to enable night light vision when its night time. Checking of notifications on smart phone while doing important works on laptop is very disturbing and boring. To solve this disturbance Microsoft windows 10 launches a very important and useful feature. You can even reply to your message on your laptop. 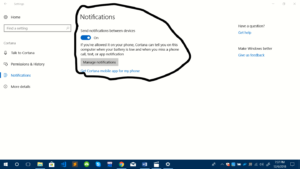 To use this application you have to install “Cortana” application on your android smart phone and setup Cortana with your Microsoft account after that you have to go Cortana setting and go to sync setting and enable notifications. Once done go to your computer home setting and click on the notifications then switch it on. 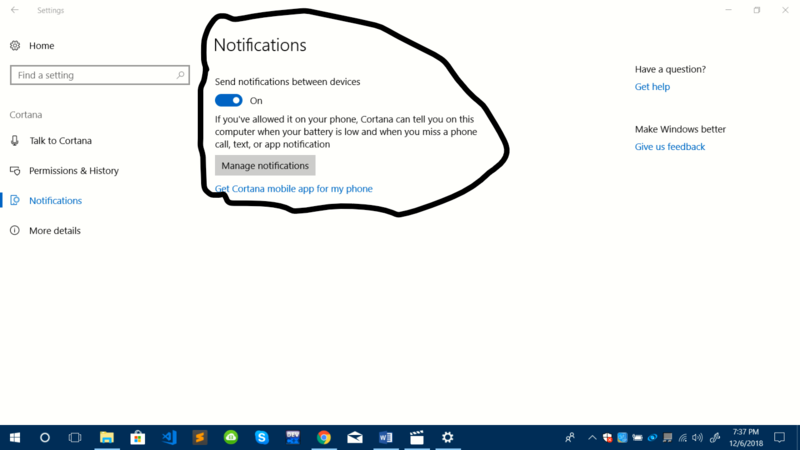 Enable this cortana and connect your smart phone with your mobile to get notifications on your laptop. This will help you from become disturbing while working, I’m also using this feature to not getting disturbing while working. This disturbance also divert our mind to rascals thinks and could not let us to engage with our work. In different universities and other places people watch videos and forgot the link to watch again. And learn different tricks from friend, seniors, teachers but they also forgot the right path or the procedure to the trick. For that we can record the screen of our system in our window. We cannot concentrate at right time but it is not a serious issue. We can play, enjoy at that time but let our PC records its screen and watch this at home with relaxation. 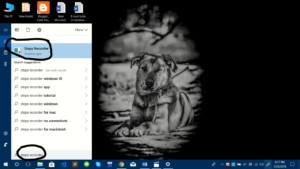 To record the screen we use different software’s but windows 10 has its own feature which is the best feature for learning and other purposes. To use this feature we should search “Steps recorder” and launch this feature to use. Just focus above image and search “Steps recorder” in cortana. wow, you have shared a very helpfull tips, thanks wittyblogger, let me read all your blogs and comment on helpfull blogs. Thank you, Stay tuned for further updates. i bookmarked this blog, i got this on 6th page of google. Lots of love admin.